Want to brighten your wedding-day hairstyle, but also need to save money for the honeymoon? Check out our gorgeous flower clips and combs that retail for only around $100. If you’re a budget-savvy bride, you can look amazing without sacrificing style—or your post-wedding financial goals. Classically romantic, a sweet lace or organza flower adds everlasting, feminine beauty to your bridal look. Keep scrolling to explore styling options for your big day! Add drama to your ensemble wearing a gorgeous lace flower with flexible petals and a sparkling rhinestone center. Style 6415 beautifully complements a lace gown or floral theme with true elegance. Spice up your look with dramatic earrings, or wear your hair down to get a more natural, carefree vibe. 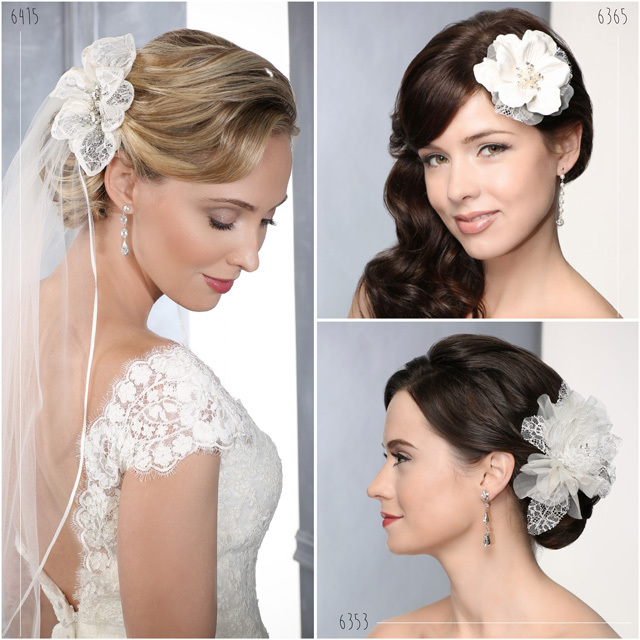 You’ll love the feminine charm of this easy-wear bridal clip. Sweet and simple, style 6365 combines satin, organza and lace petals with twinkling rhinestones and tiny pearls. This design is perfect for a little reception accent and also a cute choice for your bridesmaids! Style an ethereal organza or tulle gown with soft flower 6353. This dramatic lace and organza design beautifully pairs with light, flowing dresses for an ultra-romantic ensemble. Clip it into your bun for an elegant look, or wear it in a dreamy half-updo with loose curls. Want to wear one of these pretty designs for your special day? Visit our Store Locator to find them in a bridal salon near you!